The book they want to ban - now why might that be? 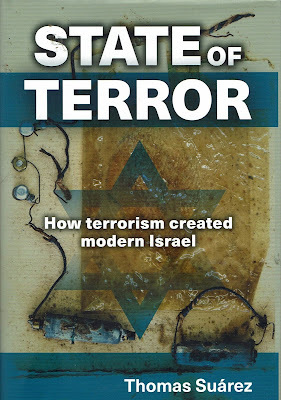 Tom Suarez has, on the basis of research in the Government’s archive written a book documenting the terrorist beginnings of the Israeli state. I have yet to read and review the book but by all accounts it is an impeccably documented book. What is also clear is that the research in this book, which is based on over 400 documents from the government’s own archives is unacceptable to the Zionist lobby in this country. The Board of Deputies of British Jews, an overtly Zionist body, which calls itself the representative body of Jews in this country has done its best to stop its author Tom Suarez speaking to meetings about his findings. The Board of Deputies incidentally is elected by nobody. It is based on synagogue membership. It doesn’t represent Britain’s secular Jews, about half of all British Jews, the most cultured and educated section of British Jews but narrow minded businessmen and middle class Zionist bigots. Many of the synagogues elect their representatives on an all male electorate. Others are simply rotten boroughs where there is no election. 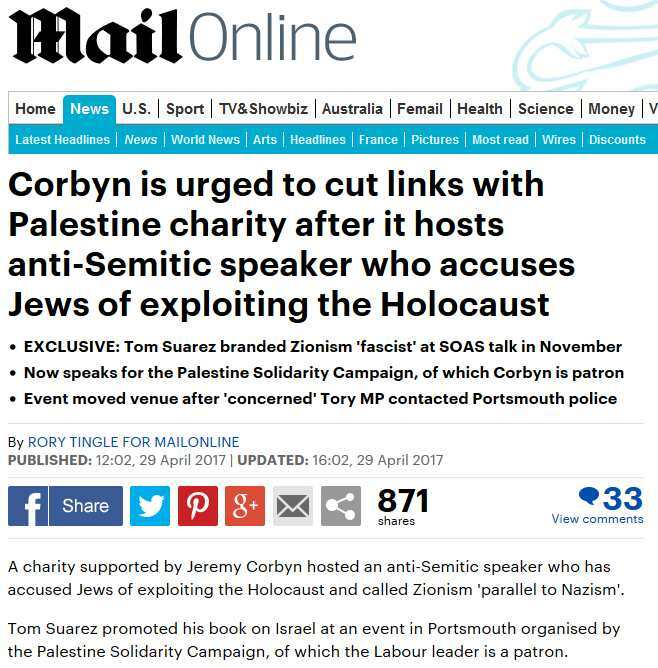 On the basis of the squeals of Britain’s Israel lobby, which doesn’t want the truth about Israel to be known, a campaign has been mounted to stop Tom Suarez speaking. One wonders what they have to fear? What is worse is that this is being done under the cover of the government’s Prevent programme. Prevent was introduced on a mandatory basis under the government’s Counter Terrorism & Security Act 2015. Purportedly designed to prevent terrorism it operated on the theory that people become terrorists because they are ‘radicalised’. This absurd theory misses out small things like the fact that people became terrorists because the government in alliance with the United States went and bombed the hell out of Iraq and Afghanistan killing over 1 million people. Some people wrongly believed that the attack on these countries was because they were Muslim. The Prevent strategy assumes that people become ‘radicalised’ on the basis of ‘extremist’ political views. What are ‘extremist’ views? Anything which doesn’t subscribe to ‘British values’. Presumably Marxism, subversion, going on strike even, can in certain circumstances be held to be anti-British. Under this all encompassing rubric, the government has forced universities to vet speakers for public meetings because their young audiences may be susceptible to being unduly influenced by ideas which are not normative and conservative. Anti-imperialist ideas, Palestine solidarity and anything else outside the mainstream can be considered ‘extremist’ and thus akin to terrorism. This is the climate we are dealing with. That is also why we need to fight back. Suarez’s book attacks Israel as a terrorist state. It is therefore outside the political mainstream. It therefore gives a license to pathetic pipsqueaks like Portsmouth’s Prevent Officer Charlie Pericleous to go around trying to close political meetings they don’t like. Of course this doesn’t excuse in any way the cowardly owners of venues – whether it is the Quaker’s Meeting House in Cambridge which cancelled a talk by Suarez or the Friendship Centre in Portsmouth. A similar meeting at the Friends Meeting House in Brighton which I spoke at with Jackie Walker was the subject of similar attempts to stop the meeting by the Board of Deputies. Fortunately in our case the Friends had a stiffer backbone than their counterparts in Cambridge. In Nottingham another meeting by Jackie and myself also had to be moved at the last minute. We are facing a concerted attack by the Conservative government and the Israel/Zionist lobby in this country on Free Speech. It needs a robust campaign in response because this is a defence of the very essence of freedom and basic democratic liberties. Britain’s Palestine Solidarity Campaign has kept its head down and done virtually nothing in response to this attack on the rights of Palestine supporters and anti-Zionists. At the moment PSC is incapable of punching its way out of a paper bag, still less mounting a political fightback against government and state attacks. It even half-welcomed the government’s new International Holocaust Remembrance Alliance definition of anti-Semitism until I threw a fit. Ben Jamal’s advice to Portsmouth PSC is extremely inadequate. What is needed are not apologies after the event by Council bureaucrats but a determined campaign to ensure that no Council anywhere or any University tries to ban speakers that the Establishment in this country doesn’t like. Universities are under a legal obligation to defend free speech. Councils have to be made to if necessary. We should be tackling head on this whole nonsense of ‘extremism’. The suffragettes in their day were also considered ‘extremists’. All fighters for freedom, from Nelson Mandella to Emily Davidson were extremists. The biggest danger to freedom comes from ‘moderate’ war mongers like Tony Blair and Theresa May. The Israel Apartheid Week in British universities came under severe attack in January. One University, the University of Central Lancashire cancelled it outright. Others such as Exeter and University College London put restrictions on it. We need a nationwide campaign against the attacks on free speech. At the moment there is a Free Speech on Israel campaign but it is very weak. What we need is to organise a nation campaign in defence of our democratic rights involving not just Palestine supporters but civil liberties supporters and anti-racist campaigners. Below is a description of events at Portsmouth by one of the organisers. You might also like to send an email to Portsmouth Council's Prevent Officer Charlie Pericleous who can be contacted at: Charlie.pericleous@portsmouthcc.gov.uk and ask if he sees as his main duty closing down democratic meetings. One month ago we booked a venue in Portsmouth, the Friendship Centre, for the evening of Thursday 27 April for an event open to the public. On the Thursday morning we were told our booking had been cancelled 'because of the nature of the speaker', Tom Suarez. We quickly booked a new venue, the Buckland Community Centre, only to be told an hour or two later that that booking was cancelled too. The manager said she had received a call recommending cancellation, but would not say from whom or give the reason. She said that the City Council’s legal team had insisted on cancellation. Again she refused to give the alleged reason or legal basis for the cancellation. She did say to our Chair, Zuber Hatia, that the Council would not allow the meeting to take place in any Community Centre or Church Hall. The meeting finally went ahead in a pub in Havant, 6 miles away, to a much smaller audience than would normally have been expected. Tom was naturally disappointed , but said several times that he was glad we hadn't cancelled. The meeting was held to hear Tom Suarez speak about his recently published book, ‘The State of Terror, how terrorism created modern Israel', a book based largely on the evidence of 436 documents in Britain’s national archives. Allowing the meeting to go ahead in the normal way, with a wider audience, would have allowed more people to make up their own minds about what Tom Suarez had to say, question him about his sources and their interpretation and then read the book if they wanted to go deeper. 'I was contacted by someone informing me that the Daily Mail was going to write a story about Mr Suarez visiting Portsmouth and what did I think. I did not respond to the Daily Mail at first but just let the police know as I know that there was a riot at the LSE and a fuss in Parliament and I didn't want a big fuss in Portsmouth. The Daily Mail continued to ring my office and email me so I just told them I had told the police and hoped that was the end of it. Flick has personally apologised to me no less than five times. Obviously she would have been better not talking to a newspaper that most sensible people avoid like the plague. Perhaps, however, she was put up to it by Conservative Central Office, who saw an opportunity to create an anti-Corbyn scandal. 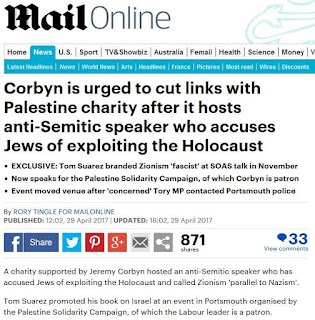 'Jeremy Corbyn charity hosts anti-Semitic speaker', trumpeted the Mail. So who was the main villain of the piece? It appears to have been Charlie Pericleous, Portsmouth's smooth-talking, oh-so-charming Prevent Officer. The meeting was advertised a month in advance, so Pericleous had a whole month in which to take any action he deemed necessary. Instead he chose to alert the Friendship Centre on the very day of the meeting that 'special security measures were necessary in view of the nature of the speaker'. The manager was spooked by this & immediately cancelled. I had a long & frustrating telephone conversation with him & after a lot of weaselling around he finally admitted that he had rung Ruba Begum at Friendship House on Thursday morning to ask if she had 'appropriate security arrangements in place'. He could of course have easily obtained them from MS Begum, but he chose not to. He agreed to meet us. Ben Jamal had given us some advice on the matter, as follows. When five of us (including Tom Suarez himself) met Charlie Pericleous a few days later, on May 9th, the meeting was extremely unsatisfactory. It was, as Tom Suarez descibed it, 'an exercise in obfuscation'. He started off by saying he had received abusive letters from PSC. I said, 'I haven't corresponded with you, only spoken over the phone.' 'No, it wasn't you.' 'Who was it then? I haven't authorised anyone to write to you, & I haven't given anyone your email address, because I don't have it.' 'No, they were letters sent thro' the post'. [Who writes postal letters nowadays?] 'I've got them here,' [pulls out packet]. 'I'd like to see them. If people are writing abusive letters in the name of PSC, I'd like to see them, because I need to deal with it.' [Rummages in packet]. 'One woman was called Tracey.' Tracey who?' 'Oh, actually I don't seem to have any of them here after all.' !!!! He point-blank refused to answer any questions we asked. 'I'm not going to do that. I'm here to explain how the system works.' He then proceeded to ramble on for a long time, going round & round in circles & endlessly repeating the same tired meaningless phrases. Instead of listening to our concerns, he started a long lecture about how wonderful Prevent was & how many lives he was saving. Needless to say he provided no evidence of this. He refused to consider any of the 'asks' suggested by Ben Jamal. Charlie would not be specific about who had told him to intervene in PSDPSC’s bookings at Friendship House and the Buckland Community Centre. He said his intervention had been the outcome of internal staff processes, but who or what had prompted their interest in the meeting he would not say. The reason he gave for advising cancellation was lack of time to assess risks or make arrangements to deal with them: Friendship House had not been told who the speaker was or the subject of the talk. True, PSDPSC had not got round to supplying the venue with the usual publicity leaflet, but when the manager had contacted us a few days before the event she made no mention of this, only wanting to know what seating layout we wanted. Over the last ten years we have arranged about 80 meetings in Portsmouth, most of them on Council property and on no previous occasion have the venues shown any interest in the identity of speakers or what they would talk about. Booking forms, if any, would typically just have a space for “Description of the booking”. Nor had the Council ever issued any general instructions about what information was needed for bookings or mentioned any need to provide it for risk assessment purposes. PSDPSC meetings have never given rise to any disturbance or posed any risk whatsoever of it occurring. So when Charlie told us that this was the first public meeting that the City Council had got cancelled in the last ten years his excuse of insufficient time for risk assessment seemed as implausible as everything else he said. Charlie himself did seem a tad embarrassed over the whole affair, giving no answer when we pointed out that he had scored an own goal as far as his Prevent programme goes, alienating the Muslim community even more. He also failed to answer when Tom asked if the Jewish Board of Deputies was in any way involved. He did tell us that Tom Suarez was not considered an extreme speaker and assured us that there would be no obstacles raised if we arranged a future event with Tom in Portsmouth. We shall see. He refused to agree to the Council issuing a public statement along the lines advised by Ben Jamal at PSC HQ, but promised that some statement by the Council would be forthcoming. As of yet (May 15th) there has been no sign of this statement. Thank you for your email....The council fully supports free speech, but council officers have to bear in mind the impact on the community of events where inflammatory statements could possibly be made. It's best if venues have time to prepare for such an impact and think about how to manage risks. As Friendship House had not been told the identity of the speaker, council officers advised them that the event might be controversial. They made their own decision to cancel. A charity that runs a council-owned community centre was then approached to host the talk. Given the short notice there was not enough time to assess the possible impact and put any measures in place to deal with any risks, so council officers advised it would be best for them not to go ahead. I replied to Ms Barnard myself on May 6th, asking her who might be making 'inflammatory statements'. I pointed out that it looked from the letter as though she thought Suarez might do so, & that this was insulting & possibly libellous. I also asked her clarify what 'risks' there could possibly be. Her reply was to say that she had forwarded the email to her line Manager, Louise Wilders, Director of Community and Communication. Ms Wilders has so far failed to offer any clarification, sending one email which entirely failed to address the questions, & ignoring two further emails. PSDPSC is not letting this lie. We are putting in a Freedom of Information request for all emails, notes, minutes, reports and correspondence related to the cancellation of the meeting.